We were so pleased with our experience with 44-16, The interpretation of the brief for our technical animation was amazing, and the end result just kept getting better and better. We had 100% satisfied clients, and it made our job so straightforward. The guys at fortyfoursixteen are fantastic in developing filming solution options for us. 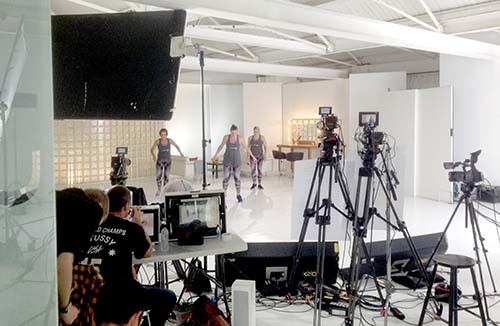 Our Dance fitness business FitSteps requires regular updates and the need for regular filming on budget on time is critical. Their development, set up and ability to direct our filming has been second to none, their filming recommendations have allowed us to produce more end user product than we have ever done before and often under budget. Not only is the filming day efficeint and well directed, the end product and the way they construct the filming helps you focus on your outcomes and gives plenty of options if things don't always go to plan. For us they have been an ideal partner in the full end to end planning to production to end product. It is always an absolute pleasure to work with Fortyfoursixteen. They really take on board what you want to achieve but also make some fantastic suggestions prior to filming and onset. Based on the final outcome of their productions, the quality, and ease of working with them, I would certainly recommend! I worked with Neil and his team on the production of a customer testimonial. The quality of the content and the service was excellent. I'd definitely recommend them to anyone. I asked fortyfoursixteen films to produce a series of video testimonials for Solardome Industries. Their pricing was competitive, they were organised and efficient working on location at multiple sites, they we very professional with our clients and ultimately we were very happy with the final editing and production. I cannot speak too highly about my experience of fortyfoursixteen, they constantly over delivered excellent output and work for me in a variety of projects. But what really stood fortyfoursixteen out from other video production companies is their process of work. The team understand and develop briefs and requirements adding insight and creativity at all points - they help guide the project and finished work to perfection whilst appreciating the difficulties and requirements of a demanding client! Great work and professionalism, attention to detail and creativity makes fortyfoursixteen an organisation I am happy to recommend. fortyfoursixteen were remarkable at clearly updating me on the project, offering expertise and advice on how we take the project forward. Our client was very happy with the final result and has already talked about completing further projects with them in the future. They are a very approachable company who delivered a highly professional short film yet still within budget. I cannot speak too highly about my experience of fortyfoursixteen and would be very happy recommend them every opportunity. Superb company to work with. We were in regular communication with regard to the interview questions, who to interview and how to plan the filming schedules. On filming days - 4 altogether, I organised a tight schedule which we stuck to and the whole team were a pleasure to work with. The end result is fabulous and we have had many compliments about the professionalism and quality of our films. They captured the essence of Notre Dame perfectly! Highly recommended! I have worked with fortyfoursixteen films for several years and I cant recommend them enough. They have completed several sorts of projects including simple show reels, step by step videos to full production on an awards event. Their patience is great, their knowledge and advice in terms of filming and what we need to get the job done is second to none. After instructing fortyfoursixteen films to help Steljes create four product videos on our behalf, I was quickly impressed with how easy Neil and the team made the whole process. The team took control of everything from the scripts for the films through to the casting and had thought of everything along the way. The final result was brilliant and well received internally and amongst our client base. We have now commissioned a further two sets of videos and would not hesitate to recommend fortyfoursixteen. We had a very clear end goal in mind and Neil went out of his way to really understand this and our industry in order to put a clear plan into place to get us there. fortyfoursixteen were excellent, especially on location where they knew exactly what shots were needed to produce the end product we wanted. They managed the shoot day brilliantly having planned a scheduled to get all the shots we needed and more for a good selection during the edit. Many thanks to Neil and the team. From start to finish, Neil and his team provided a very professional and effective level service and communication throughout the production. A clear and understood program was created taking into account my needs as a client, along with the taking on board recommendations made by Neil. The end result provided the visual statement I wanted, and I am delighted with the quality of the finished product. I would not hesitate in recommending fourtyfoursixteen for other video production work. We were delighted with the whole process of working with fortyfoursixteen. They visited our school prior to filming to identify the purpose of the film and the targeted audience. They wanted to ensure that they reflected the ethos of our school and did so by meeting the children and having a tour of our school environment. They responded extremely well to our needs and thoughts. On the actual filming days they managed to be unobtrusive and put people at ease, whilst achieving a very high quality product. We were delighted with the outcomes and so were our stakeholders; please view on our website: www.birkwood.org.uk. We wouldn’t hesitate in recommending fortyfoursixteen and using their services in the future. I have to say that I have never worked with such a professional supplier in my 11 years of trading. I was able to introduce fortyfoursixteen directly to my clients who all felt extremely confident with the ideas they put forward, the clients trusted him and felt he was part of the team. They deal with every aspect of the process in a seamless manner and nothing is too much to ask. They have a great process and sign off structure which helps the project run smoothly and on budget. Working with fortyfoursixteen is simple and straighfoward you really do get what you ask for and with the last budgets they delivered high above the clients expectations. We recently worked with 44-16 on two school projects. 44-16 are a great and professional company to work with. The team delivered an outstanding service over the four days of the project. The team understood and developed the project briefs and requirements to produce an outstanding professional film. We would highly recommend 44-16 for any organisation. I wouldn’t hesitate to recommend Neil and his team as working with them is so stress free! Neil takes the time to understand your business and what you are trying to achieve with the video to make sure the end product is perfect. Neil takes control of everything requiring minimal input from me which is just what you need when outsourcing something like video production. He is an amazing director on the day dealing with both cast and crew brilliantly. I have worked with Neil on some shoots where I have pushed him to probably pack far too much in to the time available and he has managed it all calmly to ensure I got the end product I wanted. I have been incredibly impressed with Neil and his team, they are a pleasure to work with and I look forward to working with them on our next video. I have worked on several projects with 44-16 who have enhanced the profile of the Museum tremendously. The video pieces they have created with us from story board right through to post production and editing was quick, high quality and with stunning results. We simply couldn’t operate without using film as a marketing tool now and I would not hesitate in recommending them to any organisation looking to engage with broader audiences through this medium. We have been working with 44-16 for many years. And they’re true experts in their field. Regardless of the brief, timescale or budgetary constraint we provide, they always bring passion, creativity and extremely high standards to every project. They have a brilliant approach, aren’t afraid to challenge our thinking (in a constructive manner) and deliver fantastic results. I would have no hesitation recommending Neil and his team to anyone looking for high quality video production. Working with 4416 a very collaborative and flexible experience. Their relaxed style put everyone at ease and allowed us to manage the ongoing needs of the business whilst filming took place. Our experience working with Neil and fortyfoursixteen was excellent. First and foremost, Neil listened to us, and listened well. His suggestions for the format, the techniques, the pace, were right on target with what we were looking for. In fact, he showed us possibilities that we would never have thought of on our own and helped us to achieve a final product that was more than we had hoped for. Understated, but enthusiastic, interested, flexible, and organised, Neil was interested in who were are and helped to identify exactly what we wanted to express in order to reflect who we are. He asked relevant questions and worked with us in close collaboration, so the end result truly reflects what we want to say about ourselves. Your extras are fantastic. We could never have imagined they could be so good. Thank you for all your hard work. We're thrilled. Great company to work with. We asked them to produce a series of videos for our website and they delivered just what we asked for and more. I would have no hesitation in recommending this company. Neil is a great guy and really listens and knows his stuff.